Our intrepid group of travelers took advantage of our final morning in Oz to tour the Melbourne Zoo. Shout-out to staffer Emily McLeod for organizing it and to Jenny for serving as our tour guide! Their most recent program was called “Who gives a crap”, and promoted the use of recycled toilet paper in order to protect habitat. 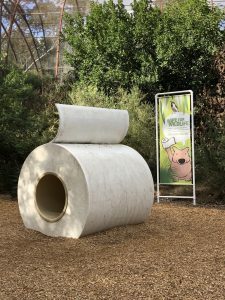 We didn’t have time to fully explore this exhibit, but there were intriguing models of toilet paper rolls and toilets that I’m sure were a big hit with the child visitors and probably many of the adults. 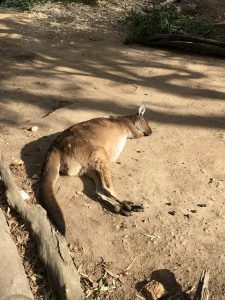 We definitely learned a lot about the innovative ways that the Melbourne Zoo is using to try to protect local (and international) wildlife. 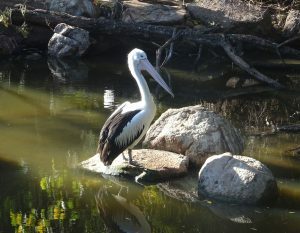 The theme of isolation and connection was reflected in the diversity of indigenous species we saw (emus, kangaroos, wombats, and pelicans, as well as many beautiful birds and even stick insects), evolving in their previously isolated corner of the globe, and in the way they are threatened by the increasing interconnectedness that human activity has created. 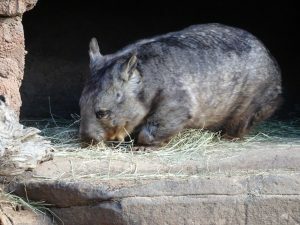 Hopefully connections (among researchers, across countries, and between humans and animals) can help to protect them as well.